in which we want to see threes and threesomes of all kinds with your makes (and some cool/vintage/grunge/... Steampunk of course). By following the LINK to the introductional post for the challenge you will also get to the inspirational pieces team A has done to get you on track. Today it is time for team B to provide you with some more! Bastel-Welt Schobes, who are giving away a 20 Euro voucher to use at their web store! We are very grateful to have them with us this year and what a fab start they make for 2015! (if you want to see more details or learn more about the projects just click the teamies' names to get to their blogs. And if you even take the time to leave them a short comment so they know you were there, you will make them very happy! 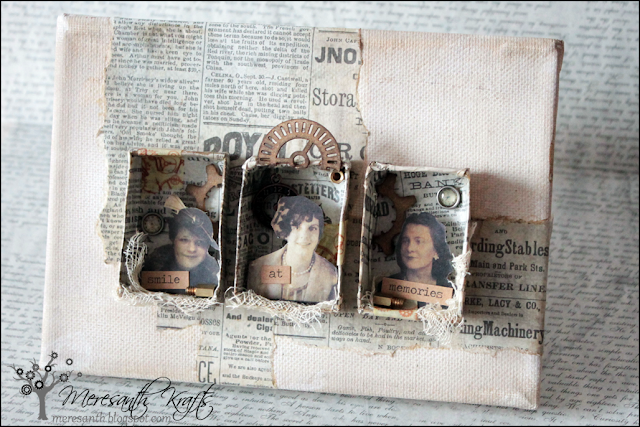 Loved making this...grungy gears softened by grungy roses - all in 3's of course! All good things come in threes, or? Adventure, Fantasy and Power - that's my favourites, when I think about the magical Steampunk world. Mixed media on a 4x6'' Art Journal Card. My "Three Men in a Boat" (based on the novel by Jerome K. Jerome) haven't entered their Steampunk boat yet - but the look like real pioneers and more than ready to go, don't they? You get to the post with the inlinkz collections (for the 2D and 3D makes) by clicking HERE. Prize winner and Top 3 will be announced about a week after the new challenge has started (maybe a little later this time due to school (and therefore skiing) holidays over at my place). And we will also announce our new DT members from the DT Call (which is still open until the end of January too! Further information can be found HERE). 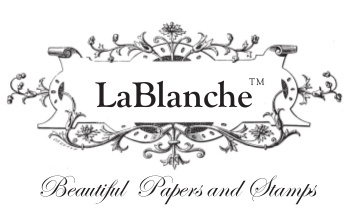 We are looking forward to see your wonderful entries soon! Please, let me know which mail adress I should forward to IE so they can send the voucher to you. As we had no regular challenge for December the next Top3 can be made and seen with the actual January challenge that is to be found HERE and is open until the end of the month as usual. And don't forget to come back on January 15th to see the makes of Team B! And if you haven't already checked out our sponsors for 2015 click HERE. 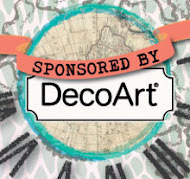 We were able to get some fab new sponsors aboard and also to keep most of our beloved old and true sponsors as well! Welcome Our Fantastic Sponsors for 2015! 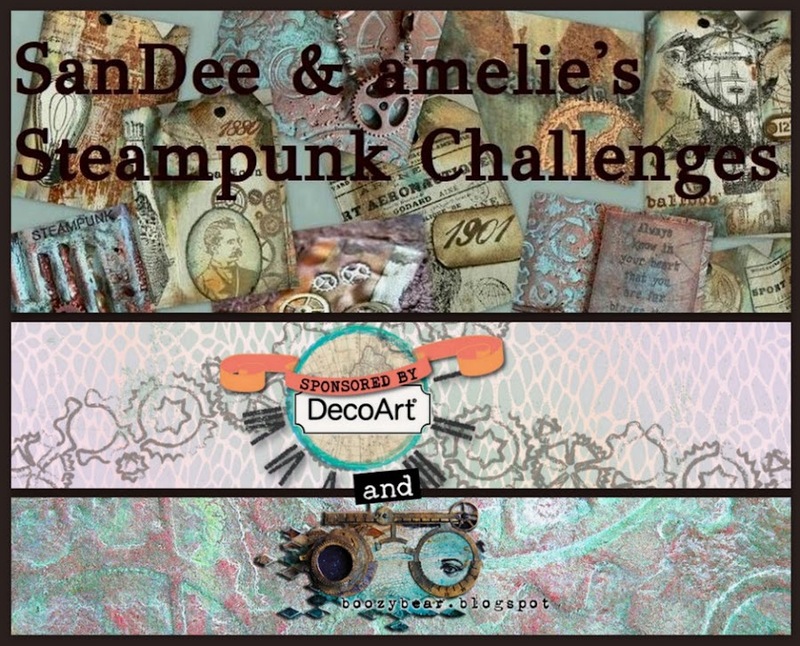 Welcome back to SanDee&amelie's Steampunk Challenges, dear Steampunk craftin' friends! Today I am very proud to announce this year's sponsors who have so generously agreed to donate some awesome prizes and by doing so make our tiny creative spot even more wonderful! Thank you all so much for being with us for 2015! The team and I are overwhelmed by our sponsors' generosity and want to say a huge THANK YOU to all of them! PS: check back on Saturday, 10. 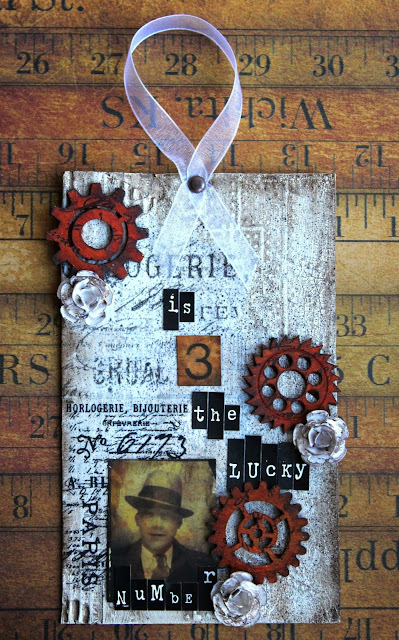 Jan. for the winners post and on January 15th for the mid-month reminder with the second bundle of inspiration for our actual challenge "Three's my lucky number". Servus and Happy New Year to you all, dear Steampunk friends and followers of SanDee&amelie's Steampunk Challenges! I hope you all had the most lovely holidays and that Santa and Christkind were good to you! We wish you good luck for 2015 and loads of wonderful crafty adventures! This means you have to either incorporate the number "3" itself or make "three of a kind" an important factor of your creation. That could mean to add three identical gears as embellishments for example....or repeat the same stamped image three times...or create three visually connected objects that form a trio...just to name a few possibilities...the 3 has to be an obvious element of your design. And just in case you have missed it - we are having a DT Call that will close on January 31st! More detail can be found HERE. 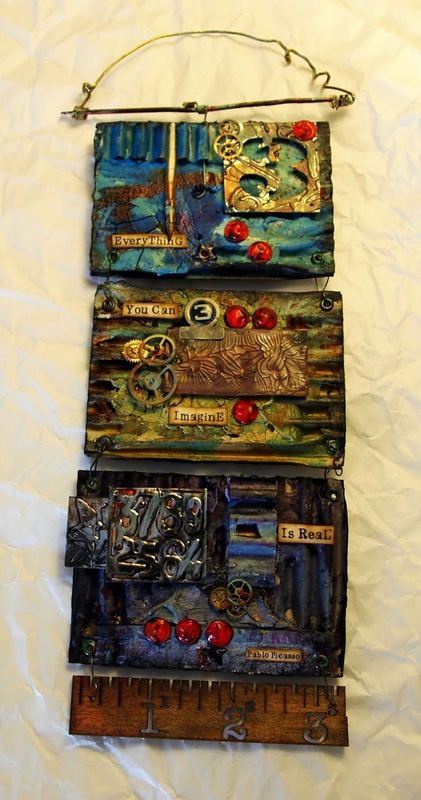 we offer two separate collections to enter our challenges - one for the 2D makes (like tags, cards, canvases, art journal pages,...) and one for the 3D projects (altered objects, shadow boxes,books,...). Please, make sure to enter your projects to the according inlinkz collection. Our Top3 for each category will be chosen by team vote and as we find it hard to compare 2D and 3D projects, we have decided to keep them separate. 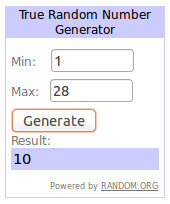 The prize winner will be drawn randomly from all proper entries and will be announced on the next Saturday after the challenge has closed (as long as there are at least five days inbetween both dates. Otherwise the announcement will be made on the following Saturday). Each month's sponsor will be announced in the mid-month reminder post (on the 15th of each month) which also brings to you the second bundle of inspiration from Team B for the actual challenge. 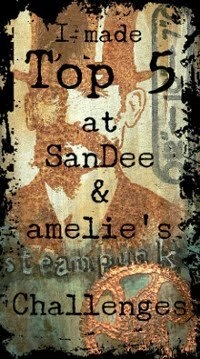 There are only few challenge rules, but we ask you to take the time and read them (if you are new to our little steampunk corner) so you won't have to be excluded from any prize draws or votes. These can be found with the tabs on top of the page. If there are any questions or problems, you'll find the email to write to in the side bar. And, please, think about leaving a comment here and there with our teamies' blogs to let them know you paid them a visit. It just takes some seconds to do so and make someone very happy. You get to our team members' blogs by clicking their names above the projects they have created for your inspiration (or by using the links provided in the side bar). Wow! What a wonderful start for the new year! 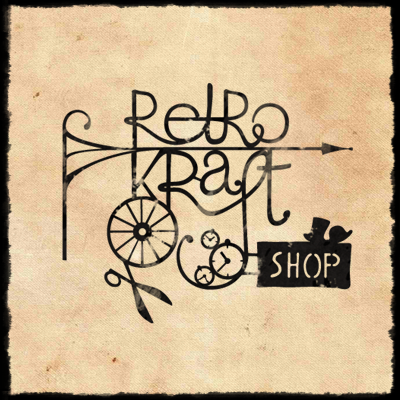 I hope you will join in and have fun creating some Steampunk goodness! Can't wait to see your entries!